The best guide to positive behavior supports for any child to help prevent behavioral problems and encourage desirable behaviors without the need for excessive discipline. While there are methods of discipline that are necessary to help kids learn what they should and should not do, it’s also extremely important to always apply proactive strategies as well. These are usually incorporated into any behavior intervention plans and are the most important part to decreasing things like temper tantrums, meltdowns and aggressive behavior in children. If you are truly looking for some great ideas of ways to help children that are positive and proactive, you won’t want to miss my eBook. 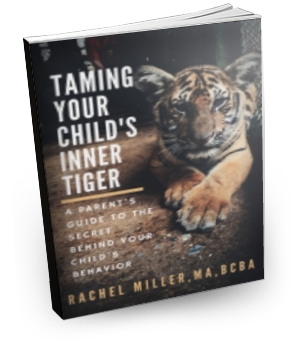 It has great details of techniques to put in place on a daily basis to help with all child behavior problems, including those related to ADHD, autism, and Down syndrome. You may read a summary of some of the techniques as well if you are hoping to get a better idea of what the book entails, but as I mentioned it’s easy to download and gives more detailed information. Most plans with positive behavior supports will emphasize the importance of frequent attention and praise when children are doing the things you want them to do. This can make a world of difference in children given that attention is reinforcing for that particular child. Although, this may seem like a simple concept, there are good and bad ways to do this. For example, you want to use an upbeat tone of voice and avoid any hint of criticism along with the positive praise. Be sure to check out the link above with the best way to praise kids. Sleep deprivation can lead to attention difficulties, hyperactivity, impulsivity, and frequent illness. It is also, in my opinion, one of the main causes of tantrums and meltdowns. If a kid is sleep deprived, meltdowns are likely constant throughout the day. Even the smallest hiccup during the day can turn into a huge blow up. Learn techniques to help your child get the recommended hours of sleep based on age. Do you know how many hours of sleep your children should be getting?? Check it out at the link above. If a child is having a tough time switching activities or leaving one place to go to another, you will definitely want to use these positive behavior supports. There is nothing worse than trying to take your children somewhere fun only to have to deal with a huge meltdown when it is time to leave. This page has great ideas for ways to avoid this and help a parents' willingness to do future outings. These are stories that help your child to know what to expect by illustrating details about a certain situation, skill or concept. Some examples of free social stories provided include going to the grocery store, going to school, riding the bus, and using the toilet. These are frequently used for children with autism, but are so great for ALL children!! Especially the potty training social story that will astound you with its effectiveness in helping resistant children to become potty trained. When you are dealing with defiant children, it seems like it would be easy to just use sticker charts for kids or some other type of reinforcement method. Although, these can be great techniques to use, they can also be costly (you have to allow stickers to be exchanged for bigger and better things for them to be effective). Therefore, I have provided tons of free ideas with positive behavior supports in getting your child to do frequently refused activities. This includes personal hygiene and chores. In fact there were so many great tips; I had to create two pages! Getting kids to do their homework is a common struggle among families, which is why I have provided a list of tips for getting children to study and do their homework. You can even learn how to increase on task behavior for children that have problems with attention difficulties. One of the best positive behavior supports for any behavioral problem is recognizing antecedents or triggers for target behaviors. These are things that happen immediately before an incident and may appear to cause aggression or possibly even self-abuse. This may include asking a child to clean their room, saying no when asking for something, or even loud noises for children with sensory processing disorder. Learning how to identify these and avoid or eliminate them as triggers should be a huge part of any intervention plan. This is a must for individuals that become angry when unable to have their way. They will never succeed in the world if they can't learn how to calm themselves independently. Most positive behavior supports for children that are easily angered should teach coping skills for dealing with their feelings. Using a feelings chart can be helpful as well, but applying the free anger management activities for kids provided will make the biggest difference, especially if that anger often leads to aggressive behavior. I truly hope the positive behavior supports provided make a huge difference in your child's life or children you are working with as a professional. However, if you need additional help, be sure to check out my page about behavior intervention plans related to specific behaviors and how to discipline children.